After a successful launch, Frontier passed it’s 100000th block earlier this week. Here are some interesting stats from these first blocks. Right after genesis, it took 29 seconds for the second block to appear, then 31 and 29 seconds for the next couple of blocks. Not too surprising as the miners scrambled with their setups as the final genesis block became known. After these first blocks, we see the block time drop significantly at the onslaught of larger miners, flooring at 1 second that is the limit enforced by the consensus protocol. We can see the hashing power really attacking the network after the first few hundred blocks, with block times at 1-2 seconds as the difficulty adjustment algorithm is catching up. This algorithm either increases or decreases the difficulty by diff/2048 each block, depending on the block time. 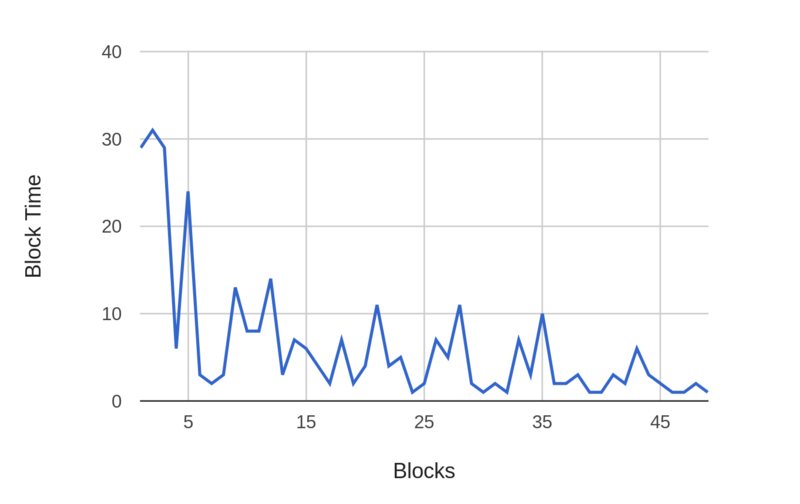 After a few thousand blocks, we see the difficulty going up enough for block times to get into the 4-5 second range. After 9k blocks, we’re starting to approach the target time of 15 seconds. While one can never know for sure whether a single miner uses multiple coinbase addresses, assuming they use a single one, we have a pretty even distribution of hash power over the first 100k blocks. 0xe6a7a1d47ff21b6321162aea7c6cb457d5476bca with 11% of hashing power is ethpool, the first mining pool for Ethereum. Next we have two large miners with around 8%. After these three the distribution is quite even, with most miners having less than 1% of total hashing power. Another interesting stat is to look at continuous sets of blocks from the same miner. This can give some insight into how hashing power and latency is coming into play for larger miners. Early after launch, most blocks in a row we saw was 6, for example blocks 1578, 1579, 1580, 1581, 1582 and 1583 mined by 0x9dfc0377058b7b9eb277421769b56df1395705f0. 0xbb7b8287f3f0a933474a79eae42cbca977791171 also mined 6 blocks a few times, for example blocks 656, 657, 658, 659, 660 and 661. This miner also mined 5, 4, 3 and 2 blocks in a row on a number of occasions, not too surprising with 21% of the total hashing power at the time. This happened very early after launch when difficulty was rapidly increasing and many miners had not yet joined the network. 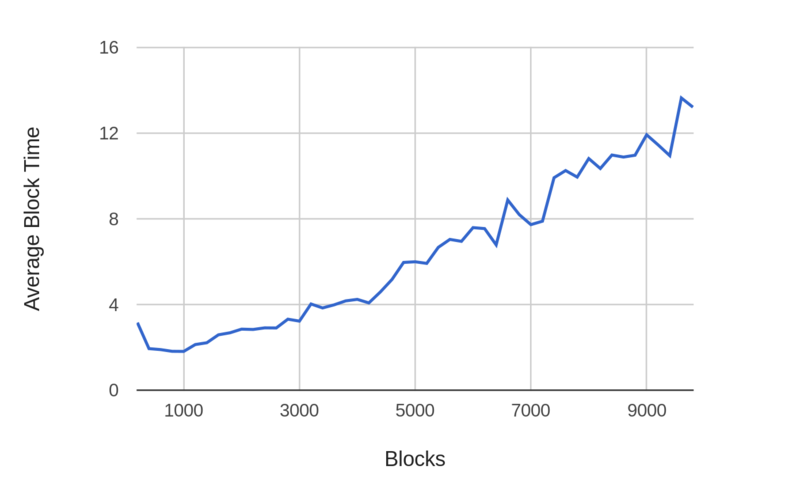 As hashing power evened out after block 5000 we did not see more than 4 blocks in a row for some time. However, recently the most blocks in a row is 10, for example blocks 103049, 103050, 103051, 103052, 103053, 103054, 103055, 103056, 103057, 103058 by ethpool. Excluding ethpool, no miner has had more than 6 blocks in a row. Stay tuned for more statistics from the Frontier network as we observe it over the next months! Gustav Simonsson is a developer in the Ethereum Security and Go teams.